It’s an old story, perhaps best illustrated by “The Little House” by Virginia Lee Burton, a classic children’s book written in 1942. A house is built. It is lived in and loved. One of Portland’s most historic houses is in dire need of just such a happy ending. It is easy to hurry past #1134 SW 12th Avenue without noticing it. Set back from its larger neighbors, its paint faded to a color akin to battleship gray, it does not blend into its surroundings so much as it disappears. A pause though is all it takes to realize that it is special, that it is unlike any other building around it, or for that matter in the entire downtown core. The house is as unique as it once was commonplace. 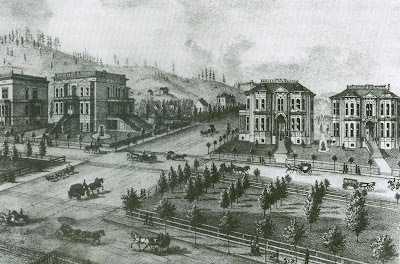 The South Park Blocks circa 1882. "It is nearly impossible to envision Portland as it was in the early 1880s, a city full of Italianate style architecture. 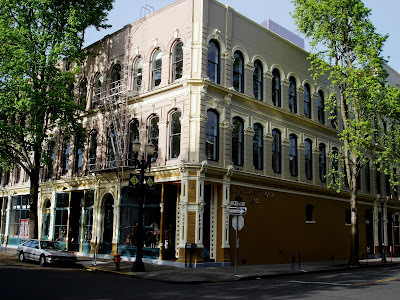 Block after block of Italianate houses, large and small, on tree-lined streets, as well as the bustling commercial center, made Portland one of the more celebrated cities of the West, remarkably distinguished for being only three decades old." From “Classic Houses of Portland, Oregon 1850-1950” by William J. Hawkins, III and William F. Willingham. 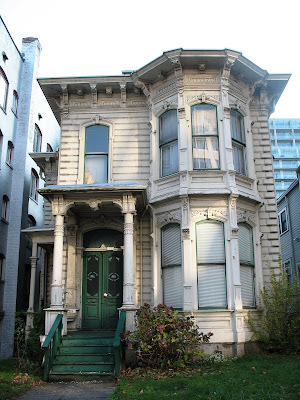 The house was built in 1880 for Morris Marks, a successful shoe merchant, at what was then #254 Twelfth Street. It was on the outskirts of the residential district that began near Fourth Street and spread along both sides of the South Park Blocks. Just west of the neighborhood the landscape was still somewhat rural in pockets. A half mile away, Chinese immigrants lived in a shantytown, farming vegetables in the lowlands around Tanner Creek, near where it passed beneath Washington Street (today along the south side of Burnside, roughly between Fifteenth and Eighteenth). It was by no means the largest house in the area. 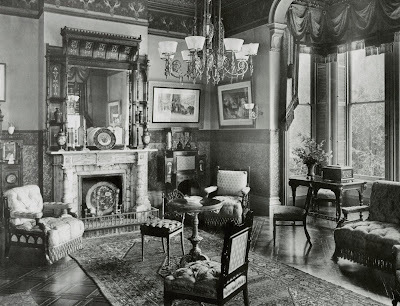 The truly palatial residences tended to be closer to the commercial district or along the Park Blocks. With its horse drawn coaches, shade trees and Italianate houses surrounded by white picket fences, the neighborhood was the domestic counterpart to the cast iron fronted downtown on the river. The Portland of 1880 was at the apex of its original incarnation as a city that rose in isolation, separated long journeys over vast distances from the rest of the country. It was at the height of Portland’s first “buy local” era. In three years the Northern Pacific Railroad would arrive, bringing with it outside influence and capital. The city was governed and shaped by the aspirations and tastes of a small cadre that consisted largely of successful Front Street merchants, most who dated back to pioneer days, and their increasingly interrelated families. Perhaps in reaction to their rustic origins, extreme luxury was in high fashion. As did the Front Street grandees, so the rest of Portland did their best to follow. From “Merchants, Money and Power, The Portland Establishment 1843-1913” by Kimbark MacColl with Harry H. Stein. The Reception Room and a bedroom in the Cicero Hunt Lewis house, built in 1881. Both photographs from “Nineteenth Street” by Richard Marlitt. The G.V. 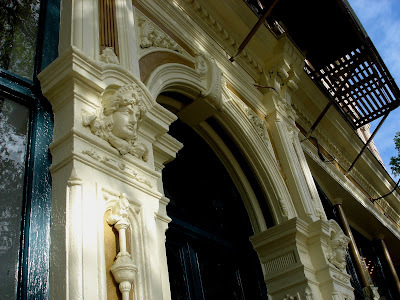 James house was built in the prevailing Italianate style in 1882, two years after the Morris Marks house. It was located on the block bordered by Eighteenth and Nineteenth and I (Irving) and J (Johnson) streets, an exclusive residential enclave that was emerging, centered on Nineteenth Street in today’s Northwest Portland. Photograph from “Nineteenth Street” by Richard Marlitt. To design his house, Morris Marks selected architect Warren H. Williams. 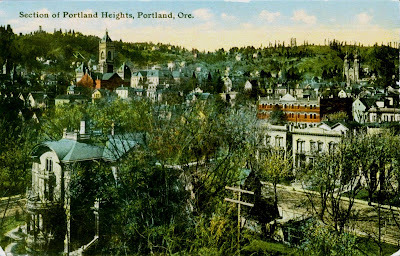 Williams had moved to Portland in 1873. In a mercurial career that spanned only nineteen years, he designed at least fifty buildings in the Pacific Northwest from Eugene to Victoria before he died in 1888 at the age of forty four. 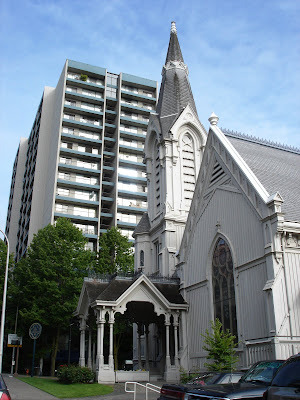 Among the surviving Williams buildings in Portland are the Old Church, the Blagen Block, the Merchant’s Hotel and a second larger surviving Italianate “mansion,” also built for Morris Marks, which would later be moved just outside the downtown core to a residential neighborhood around Fifteenth and Harrison 1910. Villard Hall on the University of Oregon campus and Robert Dunsmuir’s incredible Craigdarroch Castle in Victoria BC were also designed by Williams. From “The Dunsmuir Saga” by Terry Reksten. 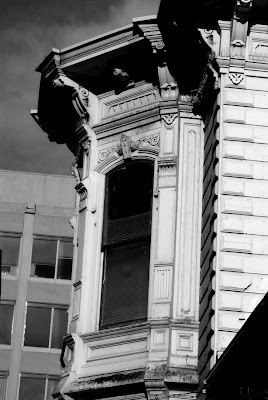 The Blagen Block, built in 1888 on the southeast corner of First and C (Couch) Streets, cast-iron fronted in the commercial version of the Italianate style. The Merchant’s Hotel was built in stages between 1880 and 1884 on the southwest corner of Second and D (Davis) Streets. 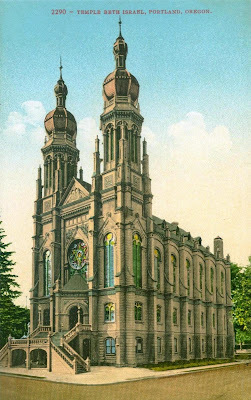 The Old Church was built as the Calvary Presbyterian Church in 1883 on land donated by W.S. Ladd (see earlier post “Lost & Found"). The Temple Beth Israel Synagogue, built in 1888. For thirty five years it was located diagonally across the street from the Morris Marks house on the southwest corner of Twelfth and Main. It was destroyed by fire in 1923. A post 1895 view of the residential area west of downtown. Temple Beth Israel, across the street from the Morris Marks house, can be seen to the far right, towards the West Hills. The mansion to the left is the Henry W. Corbett house, another creation of Warren H. Williams. 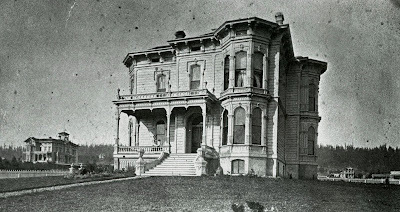 It was built in 1874 at Fifth and Taylor. It was torn down in 1936. It is the current location of the Executive Tower addition to the Portland Hilton. The Morris Marks house went through three owners before becoming a boarding house, a purpose it served for sixty years. For the last two years it has been empty. 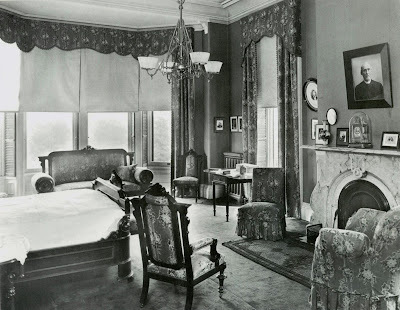 The fireplace is very similiar to the one that appears in the picture of the bedroom in the C.V. Lewis house. Today the house sits vacant on land zoned for high density residential use in a neighborhood that is rapidly expanding vertically. While there are no current plans to build on the site, it is obvious that it is only a matter of time. More immediate, the house is vulnerable to the elements, vandalism and worst of all, fire. It has been discovered by transients more than once. An effort to save the Morris Marks house is starting to coalesce. It is spearheaded by Clem Ogilby of C.R. Ogilby and Company, who specializes in building preservation and relocation. The supporters of the house hope that a suitable location can be found for the house, preferably downtown. The Preservation Club of PSU recently held an outreach meeting on preservation options for the Morris Marks house, hosted by Robin Pipkin and Brandon Spencer-Hartle which featured presentations by Clem Ogilby and William J. Hawkins III (author of “Classic Houses of Portland Oregon” and “The Grand Era of Cast Iron Architecture in Oregon.”) to kick off their efforts to save the house. Also last month, the Architectural Heritage Center hosted a lecture by historian Eileen G. Fitzsimons on the work of architect Warren H. Williams. More than anything, the house needs a site where it can be put to its highest and best use. Ideally it would be a location somewhere in the downtown core to best represent its historic context and limit the moving costs. It is a challenging task, but there are reasons for optimism. The owners of the Morris Marks house are amenable to the idea of saving the house, if a new location can be found. 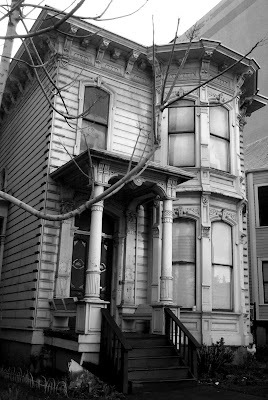 For all its years of hard use, the house is incredibly, almost unbelievably intact. Happily, the the prime mover of the project literally moves houses for a living. Letting people know is the first step, followed by creativity and then hard work. Looking back at Portland’s history, we can heap scorn on the short-sightedness that lead to the loss of many of its treasures. We can comfortably applaud the successes of past preservation efforts. But how do we fare when a major opportunity happens on our own watch? Clem Ogilby, for recognizing the need for the preservation of the Morris Marks house and for doing something about it. Eileen G. Fitzsimons, for her excellent presentation on Warren W. Williams at the Architectural History Center. Brandon Spencer-Hartle and Robin Pipkin of the Historic Preservation Club of PSU. William J. Hawkins III – Inspiration. That's a wonderful post. You should almost include an amazon link to that book. Anyone around my age will remember that one quite fondly. What a great post! I love The Little House. Great pictures and information! I recently purchased a home built by Harry Green, the President of Doernbecher Furniture after Frank Doernbecher died in 1922. The house was designed by Herman Brookman, and built in 1927. I am now doing research on Doernbecher and Green. Do you have any sources or info to help in this effort? On your "For You A Rose In Portland Grows" blog, I noticed you have used some 1961 Rose Festival Parade photos. I have a set of similar images taken from the same location by, I am assuming, the same photographer. I think we even bought them in the same junk shop on Hawthorne. I would be interested in buying your slides. Contact me at demilitaria@gmail.com . Thanks, Mike S.
I enjoy all of your posts but this one even more so. 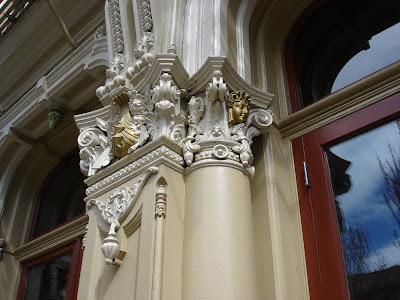 I have been an architecture fanatic since I was a small child and especially love the American Victorian period. I had not thought about "The little House" book for years and seeing the images again were a delight. I'm sure this book had a great deal to do with developing my early passion for slightly sagging old houses. Keep up the great work! Fascinating. I was researching Warren Williams because in visiting the castle in Victoria I learned that he designed a "Good Samaritan Hospital" most likely somewhere in the northwest, but it did not say where. I am curious if it is the one in Puyallup or not and nobody I work with knows. I've been fascinated by what I am reading about him and sad to see that most of the buildings he and his contemporaries designed have been destroyed, probably because the affluent parts of the city were once far too close to it's commercial core for many of the buildings to survive even the middle part of the last Century. I hope your effort to preserve this home succeed! It was a very good read. Thank you. So any idea how many feet tall the Morris Marks House is? Do you know the current status of this house? Still sitting on its original spot as far as I know.